It seems the popularity of the DJ battle royale is still much in evidence, as shortly we see two such mod events happening in the UK. First up is Basics Vs. Hard As Nails in Edinburgh on Saturday March 15th. The Hard As Nails London team travel up to Scotland to show off their soul and r’n’b sounds against Basics’ Kevin Conn and Davie Hudson in whats been dubbed ‘The Battle Of Britain’. Up there the folk know how to party so this one should see some whirlwind dancefloor action. 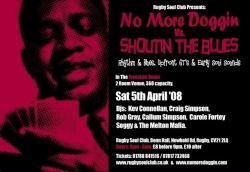 Then three weeks later on Saturday 5th April the Rugby Soul Club allnighter second room will lay witness to the mighty powers of the Shoutin’ The Blues team taking on the No More Doggin’ crew. Midlands r’n’b mania in excelsis: truly a night to savor for blues enthusiasts. For the full rundown on The Battle of Britain see the Basics Myspace page here; for more on the Midlands meet see Rugby Soul Club site here. Alternatively check the modculture forum for discussions on both. If you like your RnB, Northern, Latin, Hammond and Boogaloo HARD n LOUD… then this ONE OFF event is for you!! Surely a night to remember.